Also, the capital of Rhode Island, which is where our story starts. Dave was a stranger when he e-mailed me a week or so back. 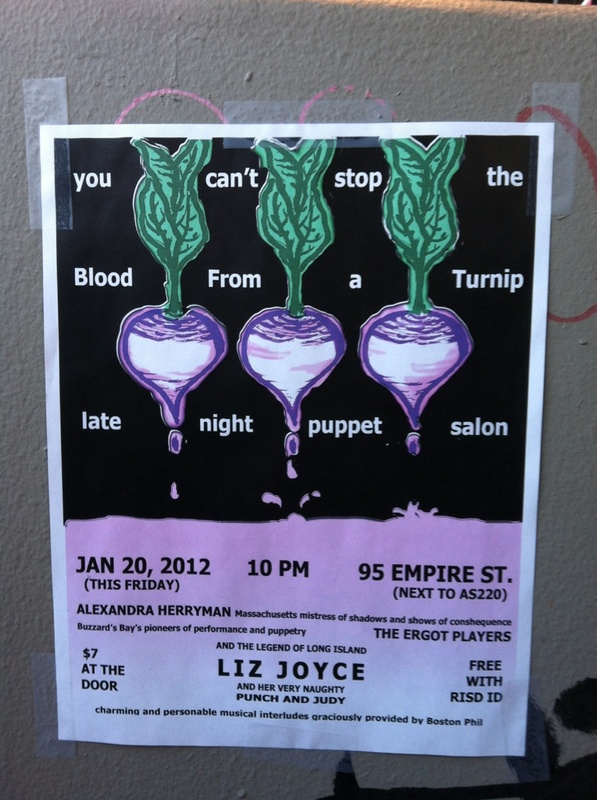 He had heard of me from Roxie at PST, and wanted to know if I was interested in bringing a show to the Blood from a Turnip Puppet Salon in Providence, RI. At this moment I feel I have exactly one show in my repertoire that is capable of going anywhere, and that is The First Person to Consider the Sun. It’s a lovely show and I am happy to take it anywhere it’s invited, but it takes a lot of people to perform. I put Dave on hold and called those people up. Corianna and Phil said yes right away. Tyler said no, as he’s inside a wall of other rehearsals right now. Emily said no because she was going to Mexico. We all paused for a moment to think about how much we’d rather go to Mexico than Providence. Two out of four was pretty good. I called Dave back and told him we were in. Gaps in the casting were filled by Nina, who had done Emily’s role before, at the First Light Festival in Brookline, and Claire, who had seen the show and was conveniently standing next to me when I learned that Tyler couldn’t do it. Since Tyler normally played the role of “Man” we had a brief moment thinking we should make the puppet into a woman if Claire did his voice. I made some repairs to the puppets, but in the end not that one. I was okay with this bit of gender confusion. And on Friday night we drove to Providence. Dave greeted us, and I met Amanda, who was the stage manager. We were sharing the stage with Ergot Players (who I later learned was led by an artist, and they had built the show out of paintings she had lying around), and Liz Joyce. LIz, we discovered, presides over Goat on a Boat puppet theatre in New York and was making the journey to Boston the following day for the Puppet Showplace Slam. Phil, who was on time for load in, had a beer with her and her partner, Alex, while the rest of us parked on the snowy streets. And when it was 10pm, and everything was set up, and we had practiced a bit, and the audience had come in, we did the show. And they clapped. And it felt good. After the show we all went for a beer at Trinity Brewhouse. Amanda and Liz and I talked about theatre and puppets and the slam network. Amanda introduced me to her own company, Sleeping Weazel, which is miraculously based in Boston. Liz and I joked about what was to come the following night, when we were all due at Puppet Showplace for another raucous adventure. We made friends. I added to the sensation of feeling part of a community. And that is how an e-mail from a stranger became a demonstration of providence.